Should you invest for cash flow or capital growth? What are some of the pros and cons of each investment strategy and which is going to be better for you. Should you invest for cashflow or capital growth? The answer’s both, but rather than just say that and the video, they’re going to look into some of the pros and cons of capital growth and then some of the pros and cons of cashflow so you can decide what’s more important to you as you’re looking at Nsse potential investment properties. 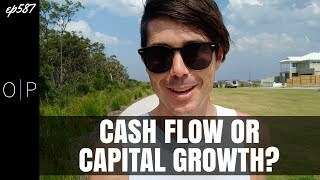 Hi, I’m Ryan from on-property dot Com dot U. I help people achieve financial freedom and this is something that’s been coming up a lot lately in videos that I’ve been doing with Ben Everingham from pumped on property and that’s just this idea of should you invest for capital growth or should you invest for cashflow? And as I said at the start of the video, the answer is you should be investing for both, but I want to get you to have a look at your investment goals at your life situation and to try and work out which of the two is going to be most important to you so you can focus on that in your search while at the same time trying to get both of them. So let’s start with capital growth. And the pros and cons of capital growth, capital growth has traditionally been the investment strategy for most investors in Australia to achieve wealth through investing in property. The idea is very simple. You purchase a property for a certain price, that property goes up in value, you make money when you either sell that property or you borrow against that growth to go ahead and invest elsewhere or to simply take it out and spend it. One of the things that makes capital growth so effective is firstly the market has traditionally grown quite well, but also the fact that you’re leveraging your money to maximize your capital growth. So let’s say you take a 10 percent deposit, so you take $50,000 and invest into a $500,000 property. Let’s say that property goes up by 10 percent. Well that property is now worth $550,000 or you’ve effectively made $50,000 or a hundred percent return on your original cash investment. If you were to put that $50,000 in the stock market and that 50,000 went out, five percent went up 10 percent, then you’d have 55,000 and you would have made $5,000. So by leveraging and by borrowing money you can actually increase your return and because you can also rent out your property. Then ideally you’d been a situation where the renters are paying the majority of the interest on your property anyway so you’re not extremely out of pocket. So capital growth can be a great way to grow your wealth. Obviously investing in something like a 500,000 or a million dollar property and getting growth like that. People who’ve invested in Sydney and I’m seeing growth of hundreds of thousands of dollars before the peak and now declined. How many people can make $200,000 in a year? Not a lot of people, but investing in a property at the right time at the market. A property can go up by $200,000 in a year, or if you have multiple properties, then obviously that can compound and you can have growth across multiple properties over the course of a year, so that’s what’s really good about capital growth. The problem with only focusing on capital growth and investing in properties that are negatively geared so they’re costing you money every single week is that you need to have a high paying job or high paying income stream in order to support those properties. So even though those properties, I’m making a decent amount of money in terms of growth, the only way to actually access that growth is by selling the property, Oregon borrowing against it, which you again need an income source. In order to do that, it can be difficult owning these negatively geared properties because you really do need that strong income source and if you don’t have it, then you can’t support the properties. Eventually you would have to sell the properties that can just put you in a risky situation. If your life’s extremely stable, if you have a high income job, you have the extra money to spend in order to grow that longterm wealth, then that can be great, but life takes, twists and turns, and sometimes you might lose your job or you might have a breakup or things happen in life where you don’t always have that level of income, so it puts you in an extra risk that’s not just a market risk, but also a personal risk as well, and you have the market risk on top of that. So what if the market doesn’t go up and you’re negatively kid where you’re losing money every single week, every single month, and if your property is not growing in value, then you’re just losing money. Or if the property goes backwards, you’re losing money being negatively geared and it’s costing you money in terms of growth. So that’s some of the risks with only focusing on capital growth. It’s quite windy here today. She ever, in terms of cashflow, I have always been passionate about cashflow probably from the early influences of Robert Kiyosaki in his book. Rich Dad, poor dad cashflow quadrant, and the idea that in order to achieve financial freedom, you need the cashflow to support your life, and so I’ve always loved cash flow. One of the major benefits of investing for cash flow is that you’re getting money every single week or every single month, so you’re purchasing a property that is renting for more than it’s costing you, so that means every single week or every single month, there’s extra money leftover which goes into your bank account. That leftover money, it can be used to pay down debt, can be used to reinvest, can be used to fund your lifestyle and can give you a cash on cash return. So it, let’s say you that property that was $500,000 and you invested 50,000 into it. If you’re getting a positive cash flow on that property, then you might be getting $5,000 per year. Positive cashflow. That’s about a 10 percent cash on cash return. You may also be getting the growth as well or you may not. So the benefits with cashflow is that pays for itself. You don’t need that job to continually or that high income to continually have to pay for the property. If you were to lose your job, if you were to quit for some reason, if you were to lose that income stream, then the property supports itself and the property starts to support you as well, so this really reduces the personal risks of investing or the risks that your life and your stable income disappears and therefore you have to sell the property because the property is not relying on you. It’s completely paying for itself. That means it’s much easier to hold. Now, if you’re just investing for cash flow and you’re not buying in good high quality areas that are likely to grow, then you’re probably not going to be in that capital growth or getting as much capital growth and given the previous examples we looked at, when you get good capital growth, especially if you leverage, then obviously you can get a great return there. So missing out on that returns. Not really something that you want, but cashflow does come with it. A stability that doesn’t necessarily come from just capital growth, so ideally don’t want to be missing out on that growth. As I’ve mentioned previously, you want to be getting both, but having that cashflow can really create a more stable environment for you, assuming that you buy in an area where you can continually get your property rented, just makes things more safe and more secure because that property is paying for itself. It’s also really cool that if the property is paying for itself, then you can also use the rental income to pay down the debt on the property and so eventually over a number of years the residents of that property so that people renting it have effectively paid off your mortgage for you. So with that $500,000 property, we invested $50,000. We’re in a positive cashflow situation. We pay that property down over the course of maybe 15, 20, 25 years using the rental income that we’re getting from the tenants. Well in 20 years we effectively own that property. Whatever it’s value is at that point. And we only have a put in our initial $50,000 and then the rest just paid for itself. So that’s a really cool position to be in where you’re able to own a property and effectively someone else bought it for you so they have cashflow versus capital growth. But really you want to have both and getting both is difficult but not impossible. Not Everywhere in Australia can you get both cash flow and capital growth. You need to buy in the right areas at the right market time, the right time in the cycle, and you need to buy a property that has good cash flow already and above average rental yield or a property where you can actually create and generate that positive cashflow. So a prime example is a granny flat that I recently looked at with a team from pumped on property. A link to the walkthrough that property in the description down below, but that granny flat property, if you just purchased it, then you would likely get capital growth. It’s in a good area of Brisbane, which is currently saying by hype cdw as a rising market. So it’s in a good suburb in a rising market, so you’re likely going to get that strong capital growth there, but it wouldn’t rent for enough to be positive cashflow so that property would be negatively geared if you just bought it and rented out the house, but that property has the opportunity to build a granny flat out the back, and if you were to go ahead and build that granny flat, then rent out that gray flat. That would significantly increase the yield of that property, likely putting you in a cashflow neutral or cashflow positive situation. So there’s an example where it’s not your standard, just go out and buy a property and it’s positive cash flow and capital growth, but you’ve identified a great area that’s going to get the capital growth, so you purchased that property and then you go ahead and create the cashflow by building a granny flat. You can create the cashflow as well by creating July occupancies, by doing renovations. Maybe you purchase a property that’s three bedrooms, but you can move the internal walls and turn it into four bedrooms and that’s rent it for more. There’s a lot of opportunities out there to increase the cashflow of the property so you definitely can get capital growth and positive cashflow. It’s not one or the other. You can get both, but finding both and buying a property that has both a lot of the work. A lot of the effort is going to go in the research phase in narrowing down the right areas that have that rental yield or that granny flat potential in narrowing down the properties that are going to be the right fit for you and your situation that are going to give you both and this is going to take time and this is going to take effort and this isn’t going to happen automatically. You can’t just go on realestate.com looking at local area and automatically get one of these properties. Look, maybe you can if you’re in exactly the right area, but the chances of that happening are quite slim, so you need to take time to do your research, to select the right market and the right suburb to then really get to know that suburb, that agents in that suburb. All the properties in that suburb, what they sell for, what land sizes are, what the council is like and what can and can’t get approved. You’ve got to do all of this sort of research so that you can get both, but by taking that time in the beginning to find the right elements to make up that good investment property. Then when you finally purchased that property, that’s going to go on and deliver you income and deliver you growth for years to come, so take the time in the beginning to do that research to get both rather than just settling for one because you’re too lazy or can’t be bothered to go ahead and do that research. If you do need some help learning how to do this suburb research, I do have a course on how to do some research and compare suburbs to each other. Go to on-property dot com dot a u four. What’s that suburb? In order to check that out, and again, I’ll leave the links to that in the description down below, or if you need some help, then you can hire a buyer’s agent and the team over at pumped on property. The buyer’s agent that I worked really closely with, our offering free strategy sessions to help you guys get clear on where you’re at, where you need to go, and what sort of suburbs fit into that for you so you can book that Free Strategy Session at on-property dot com, forward slash session. Again, linked in the description down below. So take the time, do the research, find the right area, find the right property where you can get cash flow and capital growth at the same time. Then you’ve got two different ways to make money, so if the market goes up, you’re making money through capital growth, great, but if the market doesn’t go up, you’re still making money from cashflow anyway, so you’re making money in two ways, which is going to increase your chance of getting a return on that property. It’s going to lower your risk and hopefully longterm put you in a much better financial position and hopefully help you become financially free faster. Thanks so much for tuning into this episode. Guys. Go ahead and check out this video that I did with Kristal from pumped on property where we looked at that granny flat opportunity. There’s also another video there with Simon where we looked at a development opportunity where they purchase a block of land or purchase a property that was actually a two blocks and they’re going to get for incomes from the one property, so I’ll link to those over there or in the description down below. Thanks so much for tuning in. Until next time, stay positive.